There is a hushed silence around the table. In turn, each member of the family drizzles a few drops of our just-pressed oil onto a piece of Tuscan bread, and tucks in. Finally, Michele’s dad breaks the silence: ‘è buono’. then a chorus breaks out. ‘Si, è buono’ ‘è buono’. It’s good. Never ones for overstatement, this is as high as their culinary praise gets. Once again, our oil is good. Better than good: fresh, fruity, peppery. It has been chemically analysed at the frantoio (press), so we’d no reason to doubt its quality, but the real proof is in the tasting. Italians say olio nuovo, vino vecchio: new oil, old wine. Unlike wine, extra virgin olive oil does not improve with age. 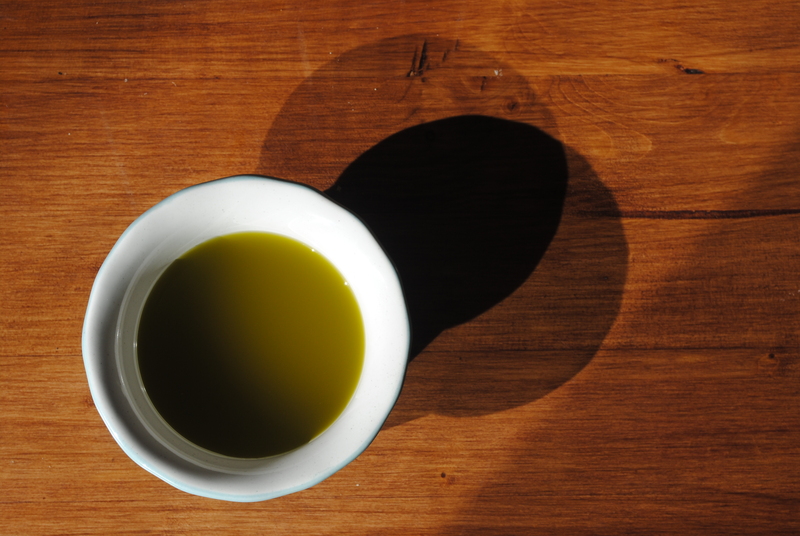 On the contrary, olio nuovo, the first oil of the season, is the most highly-prized. Made from still-green olives and consumed as soon as possible after pressing, it tastes so different from standard, stored, supermarket-bought olive oil that here it’s treated as a separate product. In Tuscany it’s honoured in feste (of course) and family feasts, and there’s a scramble to obtain some every November. Tuscan oil is known for its concentrated flavour, and new Tuscan oil, thick and dark with a strong, peppery flavour, packs a particular punch. New, unfiltered oil has a cloudy appearance due to the tiny flecks of olive which are suspended in the liquid. After a couple of months, these settle, forming a sediment, which, by the time most commercial oil is bottled, has been removed. These flecks of fruit give new oil a freshness and intensity which is surprising to people (like me before I met Michele) who have only tasted bland supermarket oils and wondered what all the fuss was about. The strong, grassy flavour of newly-pressed oil only lasts a few weeks before it starts to fade. That’s why it is not something to be rationed or saved for special occasions, but enjoyed for its ability to add depth to even the simplest meals. It deserves to be splashed liberally over salads, poured generously over steak, soaked up with soft bread. Its strong fruity flavour can make a wintry soup (such as the bean or farro soups typical of Lucca) or risotto sing. 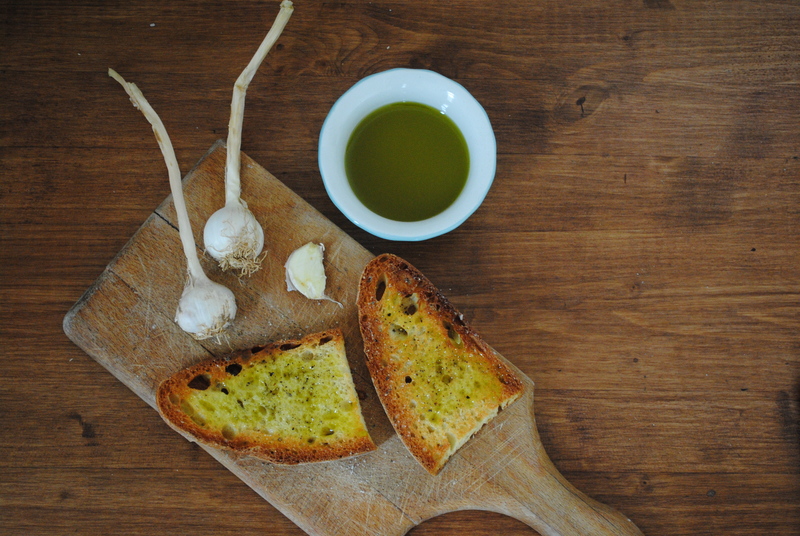 A piece of toasted bread, rubbed with a sliced garlic clove and topped with a glug of olio nuovo and a pinch of salt and pepper (known as fettunta in Tuscany), is a snack fit for the gods. Storing oil properly (away from light and heat) does help it to retain its flavour, and it should last a couple of years, with oil made from unripe olives having a longer shelf-life. But Tuscans know that you never again get that same intense flavour hit, so come November, they enjoy it as often as they can. Slice the bread into slices about 1.5 cm thick. Grill or toast the bread on both sides until it’s crunchy. 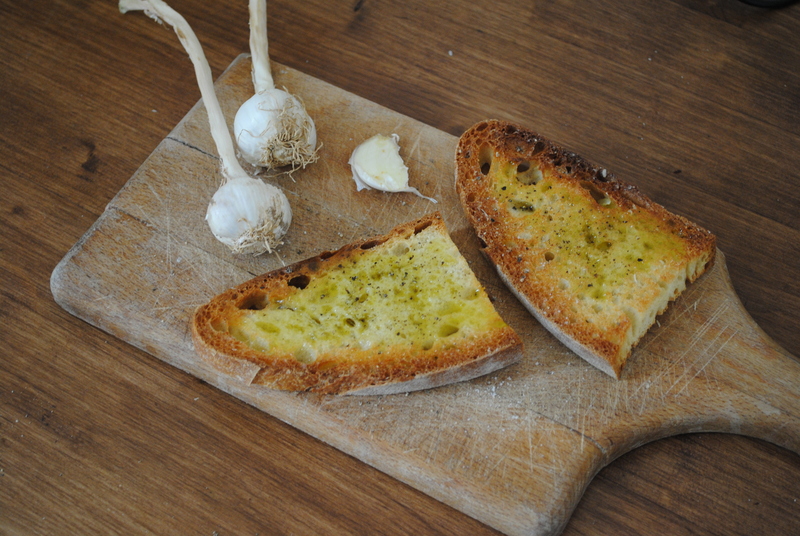 Slice a garlic clove in two and rub over the hot bread. Drizzle with olive oil and add a generous sprinkling of salt and pepper. Your oil looks wonderful, congratulations!! I feel like I have consumed my body weight in new oil and am loving every minute 🙂 Thank the stars I’m here in November!! Autumn is foodie heaven in Tuscany! I know where I should be next November! Would adore tasting what you describe above first hand. Yes, lots of olive oil is incorrectly or confusingly labelled, and some is just not even olive oil – it can be a very dodgy business. That’s why we think it’s important to know where your oil is from, to purchase oils which have DOP, IGP or other guarantees, or even better, buy directly from the farmers. That looks marvellous, and how exciting to be tasting your own oil. Well done! Wow, this is amazing. I never knew about the olio nuovo. It sounds so good. And drizzled on top of crunchy bread looks so delicious! Congratulations on getting the praise from the oil guru! Those few words must have sounded like heavenly music to your ears! So how do you decide how much oil to put away and how much to consume right away? How many bottles of olive oil will you make with this harvest? I’m always fascinated about the production of olive oil – and I’ve never tasted any fresh off the press! Some day I hope to be able to experience this! We basically start using it straight away and don’t save or ration it out, but we have enough that we keep a big drum for ourselves and we just refill it when we need to. Anything left at the end of the year is either sold at a cheap rate or used for things like baking or preserving where the mild taste of older oil is an advantage. Sounds wonderful, I know where I should be in November from now on! Yes! summer is best for the weather but autumn is food heaven here. Going to have garlic bread tonight for my dinner. With Olive Oil of course. all I can say is YUM!! We are heading out for BBQ this evening but oh I wish it was a wonderful little Italian trattoria somewhere!!! Enjoy and do know whenever you all are able to sell your own oil, I’ll be first in line!!! Hope you enjoyed your BBQ anyway! Will keep the blog updated about any oil-buying opportunities! Very informative post. I enjoyed learning about the difference between older and new olive oil. Thanks for recently stopping by my blog. It is very nice to meet you both. Best wishes to you in your new endeavor! Thanks, nice to meet you too. That looks so good, I’m glad it’s turned out well. And great blog, I feel like I know loads about olive oil now! Oh, yum. Makes me wish I had some of your oil to put in the soup I’m making on this chilly day in Ohio. Oh – and a little extra to drizzle on some bread on the side, please! Olive oil on soup is so yummy. Perfect autumn food. These photos are perfect. I want to eat my screen. Yours is the second post I’ve read this week about freshly pressed olive oil, and how wonderful it is… your descriptions and photos have me planning a trip to Tuscany next November! It’s definitely the best month for food here. You just made pine for home! Would love to visit your grove next time I am in Italy. wow, wonderful, your olive oil looks delicious. You have a beautiful grove of trees. We have a local shop here called “THe Olive Oil Company” and they import over forty variety of olive oil from Italy. That’s where I shop. My family is from Genoa, Italy. I enjoyed visiting your site. Thanks! Yes, the fresher the oil,the better. Thank you for the likes! Your writing is very evocative, and you pics are lovely. we will be in Tuscany and Umbria in October 2014. Will we then only be introduced to the older oil – of this year’s (2013) crob? Early October you will probably only find the 2013 oil (still good, but without the strong flavour of new oil). Harvesting in Tuscany and Umbria often starts at the end of October so that’s when the new oil becomes available. It doesn’t always arrive in the shops immediately but there are lots of food festivals around this time which would have it, or you could get some directly from a farmer. Enjoy planning your visit! Thanks for your reply. Yes, I sometimes think I enjoy the planning more than the trip itself because in planning there are no disappointments. The plan is to be in Tuscany from 27 Sept – 4 Oct, but in the Poppi / Arezzo area which I believe is not really olive grove area,but we wanted to visit the country side to that side of Tuscany as we have done the north already. 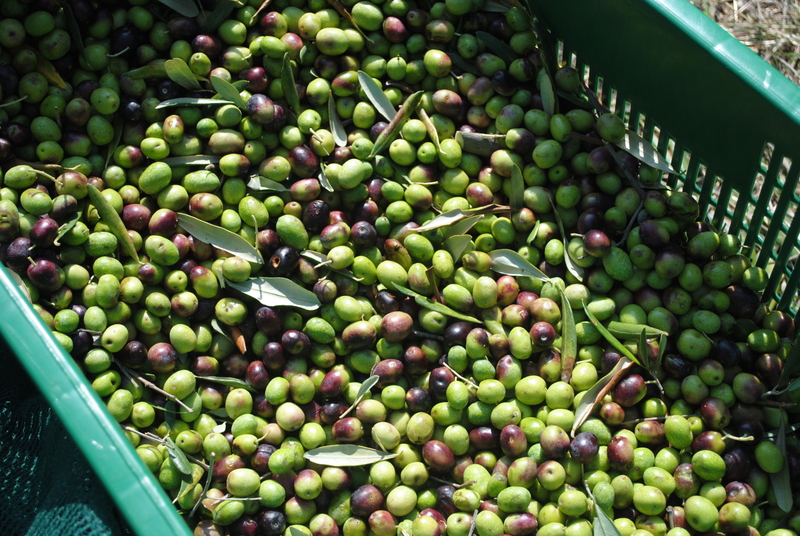 Then from 4-18 Oct we will be in Umbria in the Canalicchio area on an olive farm. I think this is then where we will be more exposed to the making and tasting of the olive oil – as you say from the farmers themselves. I enjoy your blog. Sounds like a fabulous trip – and you should get to taste the first oil of the seasonat the end of your holiday! What a tasty post 🙂 I love it! !